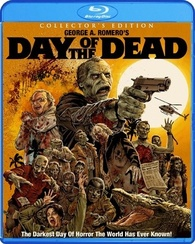 Overview - The concluding part of George A. Romero's cult horror trilogy opens with the undead roaming the planet freely. The living have been forced underground, where they make their base in a hidden missile depot, helping with the experiments of scientist Doctor Logan (Liberty), who hopes to domesticate the zombies. However, the military faction of the human survivors favour a more direct approach, and with food stocks becoming ever more depleted, they decide to take action. What folllows is the final showdown between the forces of the living and the armies of the dead. To this day, the first three films in George Romero's zombie series are amongst the scariest movie ever made, and some of the better movies of all time, regardless of genre. Not only do Romero's flesh-eater films involve horrendous looking zombies, a treasure trove of blood and guts, and some of the best death scenes in cinema, but they all have an underlying specific tone and message. Whether it be a social, economical, racial, or humanity issue, it's clear that Romero is saying something much deeper and important than showing a bloodthirsty zombie trying to bite its way though flesh and bone. 'Day of the Dead' was released in 1985, shortly before the horror/comedy Return of the Living Dead. Of course it was difficult to live up to its previous film Dawn of the Dead, which still receives critical appraise and is considered one of the greatest horror films of all time, but given Romero's direction in focusing on survivors more than actual zombies this time around, this third outing did not bode well for box office grosses. 30 years have passed now, and it seems that fans of the zombie genre truly love 'Day of the Dead' and regard it as a classic. And in my opinion, this zombie flick deserves all the praise it receives. In some undetermined time after the events of 'Dawn of the Dead', we see that the big cities and rural areas are overrun by zombies. Well, it's even worse than that, because it seems that there are no living humans around, only the dead looking to feed. Cars are abandoned, buildings have been left in ruins, trash and bodies litter the street, and walls are covered in blood. There is no power, fresh food, or entertainment. And there only seems to be a handful people left on Earth in the form of government selected teams that consist of scientists and military personnel in a last ditch effort to find a cure for this zombie apocalypse. The scientists usually travel by day up and down the coast looking for zombies to take back to their underground bunker to do a series of tests on them to see if there is a cure. the scientist in charge of the testing is Dr. Logan, who is called Frankenstein by everyone in the bunker due to his bizarre testing methods. He is joined by a couple of scientists and a woman named Sarah, who found this underground bunker while trying to escape the zombie outbreak. Meanwhile on the military side of things, a man named captain Rhodes (Joe Pilato) runs a small group of leftover soldiers, including Sarah's boyfriend Miguel, who is, frankly, losing all touch with reality. Rhodes quickly shows his true colors and soon becomes one of the scariest and most ruthless villains ever seen on film. As Rhodes and his soldiers do nothing but make life a living hell for the scientists and a few remaining survivors who find the bunker, Dr. Logan realizes there is no cure, and there will be no cure. The only thing they can do is try to teach these zombies to be docile, which is proving more of a success with each passing day. The zombie test subject is referred to as Bub (Gary Sherman), who shows faint signs that he recognizes right from wrong and a small glimpse of his former life, even though his is rotting and hungry for flesh. But what is really scary, is that these different groups of people are forced to live underground with each other, with everyone having a different opinion on everything, and things start to get really claustrophobic for all involved. I guess what Romero was trying to say here is that humanity will eventually become the blood thirsty deadites at their own hands by their angry and poor decisions. That, and to show what military order could be in an apocalyptic situation, which we have seen go wrong many times before. When we finally see Bub show an emotion of sadness and rage for a falled "friend", we the audience get a glimpse that all hope is not lost in this wretched and dead world. 'Day of the Dead' is the darkest of Romero's films as it shows humanity's true failure in helping one another and doing the right thing. Sure Rhodes and his evil soldiers get what they deserve in the way of some truly gruesome deaths, thanks to the makeup effects by Tom Savini, but nobody really wins. 'Day of the Dead' is one hell of a film, which is both frightening in both the classic sense and the monster sense. It's one the best zombie films of all time. 'Day of the Dead' comes with a much improved and all new 1080p HD transfer presented in 1.78:1 aspect ratio. This is definitely an upgrade from the previous release from Anchor Bay. This disc provides a bit of better detail and doesn't seem to be as soft. There is a fine layer of grain that gives this a filmic look. There is a bit of depth to the picture too in the underground bunker. The colors seem to pop better with the blood reds shining over the rather grim underground setting. Greens are pale in color, but are rich in saturation with some bright costumes here and there, and the clear blue skies on the outside world. Black levels run deep and inky here as well, with flesh tones seeming natural and smooth, at least on the living. It seems that most of the dirt and scratches have been cleaned up on this release as well with little to no compression issues. This release comes with a greatly improved audio track from its previous outing with Anchor Bay. This time, we have a lossless original DTS-HD Mono mix that doesn't sound chopped up or edited. It all sounds great now. The dialogue is crystal clear and is always easy to understand. The score is haunting and adds to the suspense. The splatter effects, gun shots, and zombie growls all sound great, and at times, seem to have some depth, as the noises are so well balanced that you would think this is a 5.1 audio mix. This audio track is free of pops, cracks, and hissing. This is definitely an improvement on the last release. Audio Commentaries - There are two audio commentary tracks to choose from here. One is with Romero himself, Tom Savini, Lori Cardille and Cletus Anderson. The other commentary is from filmmaker Roger Avary. The former offers a large amount of information on the making of the film, from character origins to stories on set, to how difficult it was to shoot. A must listen. The latter with Avary is basically a super fan of the film giving a commentary track on how much he enjoys the film. He even says that this movie is "Kubrickian". 'World's End: The Legacy of 'Day of the Dead' (HD, 86 mins) - Here is a new feature length documentary on the making of 'Day of the Dead'. There are cast and crew interviews that offer insights, stories, and movie magic secrets from the film. This is a must watch. Underground: A Look at the 'Day of the Dead' Mines (HD, 8 mins) - This is a short look at the underground mine for the film with Skip Docchio and Ed Demko. They discuss the ins and outs of filming in these locations. Behind The Scenes: Tom Savini Archives (SD, 31 mins) - This is one of my favorite extras, because it's all about the make up effects from Tom Savini. It shows on set and rehearsal footage of all the gory scenes. I could watch this stuff all day. Wampum Mine Promotional Video (SD, 9 mins) - Here is a an actual promo video for the mine they shot the film in. Trailers (HD, 8 mins) - TV Spots and Trailers for the film. Still Galleries (HD, 42 mins) Four separate still galleries you can choose from that play in a slideshow format from posters of the film to behind the scenes photos. 'Day of the Dead' is a great and sad look at humanity in the face of an apocalyptic world. It's truly one of the greatest zombie films of all time. The video and audio presentations are definitely improvements from the previous release. The extras are solid too, which make this new 30th anniversary collector's edition highly recommended. Yes, this is worth purchasing again.